Professional rug cleaning is a great way to keep your rugs in the best shape for years to come. When you get your rugs professionally cleaned, you also decrease the allergens that may reside in the fabric of your rugs. Picking the perfect rug cleaning company is vital to your experience, and with 30 years of experience and hundreds of thousands of satisfied customers, KIWI Services makes your choice an easy one. Our professional rug cleaning services are guaranteed to leave you happy. KIWI continues to be the best rug cleaning company in Clear Lake. With a senior rug expert, a master rug weaver, and a fringe surging and binding specialist and expertly trained rug cleaning technicians, it’s no surprise we are the best rug cleaning company in town. 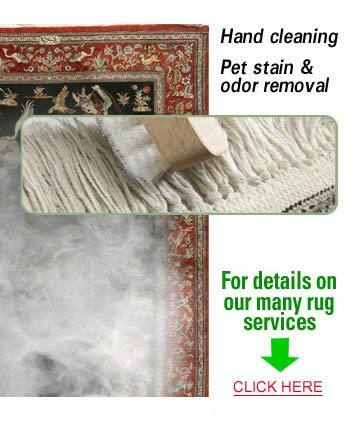 KIWI offers rug cleaning services on multiple styles of rugs. KIWI knows the importance of happy customers. Our customer service representatives and technicians can answer any questions and concerns you may have during the process. KIWI also backs all of our work with a 30-day clean guarantee, so if you should run into any issues during the process, give us a call and we will be back out right away to offer a complimentary re-do.